Here we are with the post on a brief Samsung Galaxy S8 review. With the increasing competition between the smartphone manufacturers, every company is striving on the basis of its brand new flagship phones. With Samsung and Apple leading the race, Samsung has unleashed its beasts to give a tough time to its opponents i.e. iPhone 8 and the iPhone X. First of all, let’s have a look at the new features introduced in its new flagship smartphone, the Samsung Galaxy S8. At first look at the magnificent S8, one may just be amazed by the smoothly finished curvy edges taking the HD infinity display to another level. Unlike Samsung Galaxy Note 7, both the edges are curved to give an elegant touch to the smartphone. The 5.8′ mega display with HD support provides ideal visual experience. The shiny and polished back side of the smartphone also enhances the smoothness and beauteous look. The curved edge technology from the Galaxy S7 edge is employed in the smartphone. And it seems like it will be employed in the next smartphone i.e. Samsung Galaxy S8 Edge plus. The 5.8′ display with Corning Gorilla Glass 5 protection flows smoothly into the aluminum casing at the edges giving users a boundless surface. The infinity display houses 1440 x 2960 pixels (~570 PPI pixel density) providing seamless High Definition videos support. The clinching of display downwards and the addition of 3D home button will, therefore, enhance the freedom of touch. Running on the latest Android Nougat 7.0 with the support of Qualcomm MSM8998 Snapdragon 835 Chipset, performance is at its extreme. The smartphone houses the world’s first 10-nanometer Octa-core processor. The 2 combined quad-core processors boost the device functionality and its battery efficiency. Adreno 540 Graphics Processing Unit further enhances the graphics processing and gaming experience. Furthermore, the 4 GB RAM support ensures flawless multitasking and high-end usage. The device comes with the most noteworthy 64 GB internal memory expandable by micro-SD up to 256 GB. Capture moments as they happen with the 12 MP sensible camera. 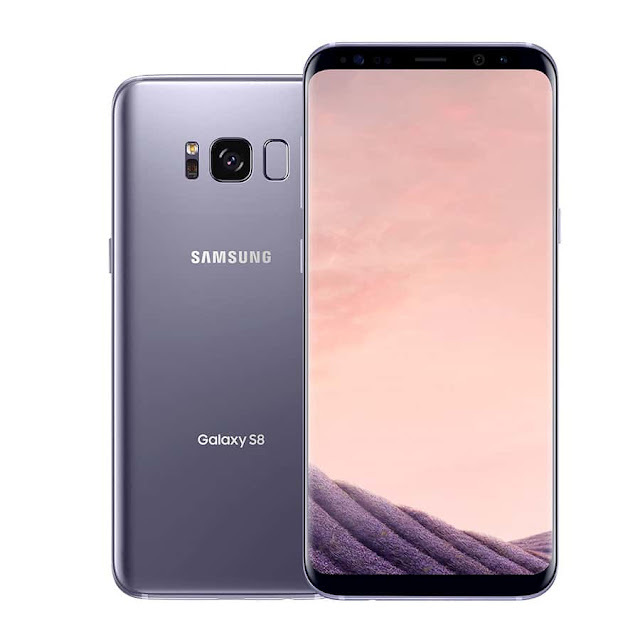 The elite 12 MP camera of Samsung Galaxy S8 and S8+ support recording 4K video. The camera adds another feature that you can take 9 MP images while recording the video. The front camera is 8 MP allowing to take mega HQ selfies and HD video recording. Both cameras work efficiently even in the night proficiently adding some plus points to our Samsung Galaxy S8 review. 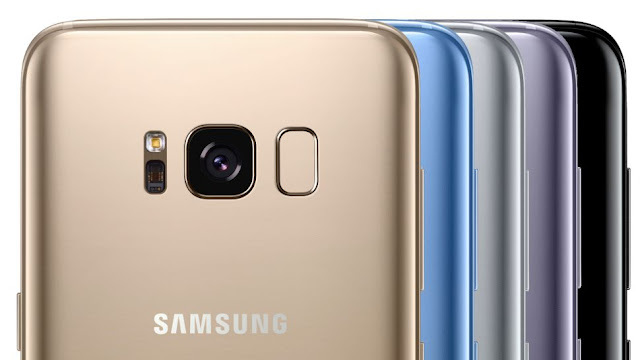 Along with the addition of fingerprint sensor in the phones, Samsung has introduced something more unique and eye-catching. That’s right, an eye unlocking sensor to unlock the phone refraining any hassle. Named “Iris Scanner” the system unlocks upon the identification of iris of the owner. By introducing the “Iris Scanner” Samsung has taken the phone security therefore at unbelievable height. Facial recognition feature adds more secure access to the smartphones as well. Artificial Intelligence produced Bixby for S8 and S8+ to change the way users can interact with their smartphones. Bixby is there to guide you through everything. 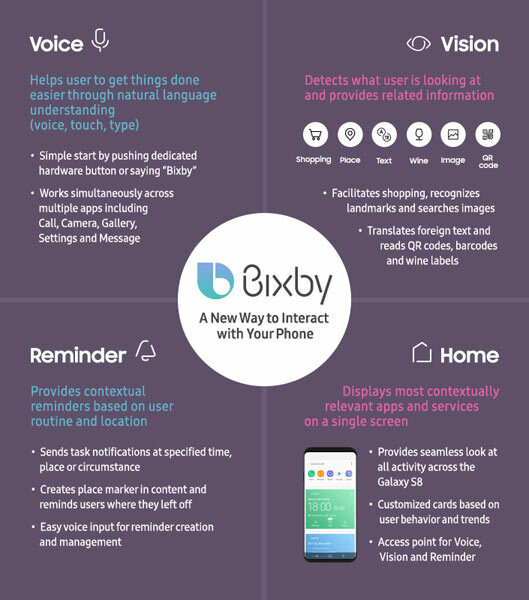 Bixby works as a personal assistant revolutionizing how you search, communicate and interact with your phone. Just show Bixby what you want from your camera and BINGO! In true words, both the smartphones S8 and s8 plus are going to be a bombshell in the target market. Revolutionized display and curved finishing consequently will prove an extra bonus for these flagships. Hence, the addition of the maximized security methods will ensure a safe phone. Introduction of Bixby will be a test for Samsung as it will have to compete with Siri and Cortana. Most probably Samsung expects to announce Samsung galaxy s8 edge release date before April 2017. Express your thoughts in the comments section on our Samsung Galaxy S8 review. If you liked the post, don’t forget to share the post with your friends on social media. In the while also check our sections of smartphones for more such amazing reviews.